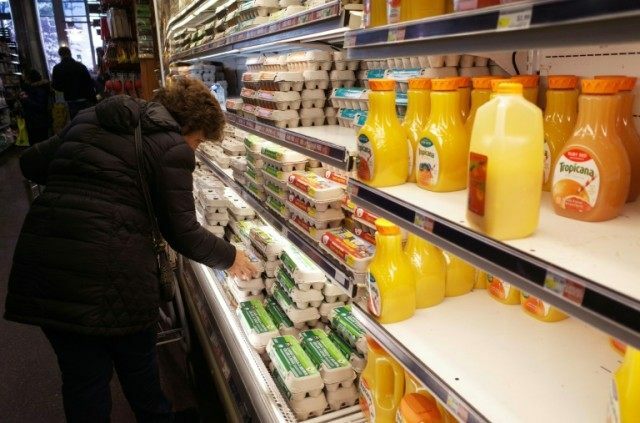 Washington (AFP) – US consumer prices edged higher in March and recent gains in core prices slowed sharply, according to official data Thursday that showed moderating inflation. The Labor Department’s consumer price index rose 0.1 percent in March, led by a decline in food, while energy prices rose 0.9 percent. Year-over-year, overall CPI was up 0.9 percent, slowing a bit from the February 12-month rise of 1.0 percent. Stripping out volatile food and energy prices, the core CPI also rose 0.1 percent in March, the smallest increase since August. The data were mixed, with prices increasing in such areas as shelter, recreation and medical care, while prices fell notably in apparel and airfares. Compared with a year ago, core inflation was up 2.2 percent, in the range of the Federal Reserve’s 2.0 percent inflation target for tightening monetary policy. The core rate of the Fed’s preferred inflation measure, the personal consumption expenditures price index, rose 1.7 percent in February from a year ago.